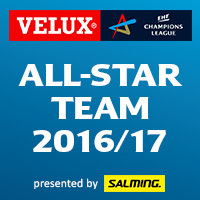 The VELUX EHF Champions League 2016/17 All-star team has been confirmed as the European Handball Federation announced the 10 players who impressed most in this season's European premium club competition on Friday. The announcement of the star selection, which was for the first time presented by the official outfitter Salming, came just two days before the new champions will be crowned at the VELUX EHF FINAL4 2017 in the LANXESS arena in Cologne, Germany. The culminating 2016/17 season can be dubbed revolutionary not only because the handball world will learn the new champions following the Last 16 exit of the defending winners Vive Tauron Kielce, but due to the fact that none of the last season's awardees made it back to the new selection. Paris Saint-Germain Handball swept half of the positions as five of the French powerhouse's players succeeded in a combined vote of fans (almost 30,000), media representatives and an expert panel. The reigning World Handball Player of the Year Nikola Karabatic, who became by far the biggest vote-getter with over 12,000 votes, dominated in the centre back position, while his teammates Mikkel Hansen and Uwe Gensheimer claimed the awards on the left side of the court (left back respectively left wing). All three returned to the All-star team after the 2014/15 season, but two more of the PSG players made a debut among the stars as Nikola's brother Luka took the best defender award and the French national team prodigy Nedim Remili impressed most in the best young player category. In total, there are five newcomers in the All-star team after an outstanding season earned the best line player award for Ludovic Fabregas from Montpellier HB, while Gonzalo Perez de Vargas from FC Barcelona excelled among the goalkeepers and the best coach laurel went to Raul Gonzalez, who steered HC Vardar to their premiere participation at the VELUX EHF FINAL4. His player and fellow Spaniard Alex Dujshebaev, who took the 2014/15 best young player award, succeeded in the right back position and Victor Tomas became the first right wing to make the All-star team for the second time since the vote's first season in 2012/13. The original list of 50 nominees consisted of exclusively stellar names as there are five nominees in the selection for each position - the starting seven plus the best defender, the best coach and the best young player (born in 1994 or younger). Players and coaches from 20 clubs and from 17 nations in the current season were selected. All ten members of the new All-star team receive the “The Spirit of Handball” piece of art created by the Swedish-American graffiti artist Shai Dahan.